process51 is an on going project of Julia Hartig and Alex de las Heras. 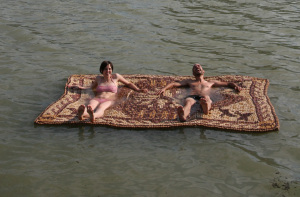 In our DIY web archive you can find all the information about our working process as well as what (we are recycling wine corks into a floating carpet with an oriental nomad pattern using the different colors wine has impregnate into the corks, the different sizes and shapes. It is important for us to show it; not as a making of, which is released after the object is done, but as an open information archive where we share the process ofresearch, collection of materials, interviewing specialists, talks, thoughts and interests, doing, changing and growing.